It's been nearly 90 years since a U.S. President visited Cuba. And for the past half century, the sight of an American president in Havana would have been unimaginable. But this week, because we're working to normalize our relations with Cuba, I was able to cross the Florida Straits and meet with and listen to the Cuban people. They told me about their hopes and their struggles, and we talked about what we can do together to help Cubans improve their lives. What I saw and heard this week will stay with me forever. I'll remember the beauty of Cuba and the pride Cubans take in their culture. On our first night, Michelle, Malia and Sasha and I walked around Old Havana, where every building, path, and plaza seems filled with the spirit and storied history of the Cuban people. We had a wonderful dinner at one of Havana's paladares, the often family-run restaurants where Americans and Cubans can meet and talk over some tostones. I'll remember the innovative spirit of Cuba's entrepreneurs, especially the cuentapropistas who are running their own small businesses like bed and breakfasts, beauty parlors, barber shops and taxi services. These men and women, many of them young, are the face of Cuba's small but growing private sector, and I was proud to announce new partnerships to help them start and grow their businesses. That includes helping more Cubans connect to the Internet and the global economy. I'll remember the courage of the Cuban human rights advocates I met, many of whom have been harassed, detained or imprisoned simply for standing up for the equal rights and dignity of every Cuban. They told me about their work to advance freedom of speech, assembly, the press and religion, and I promised them that the United States will continue to stand up for universal human rights in Cuba as we do around the world. I'll remember the passion of the Cuban people, especially when it comes to our shared love of baseball—la pelota. At Havana's ballpark, President Castro and I watched as the Tampa Bay Rays took on the Cuban national team, the first professional baseball game between our countries in 17 years. Let me just say that tens of thousands of Cuban fans cheering for their team is...intense. But when we all stood for our national anthems, it was an unforgettable moment that reminded us of the friendship and mutual respect between the American people and the Cuban people. 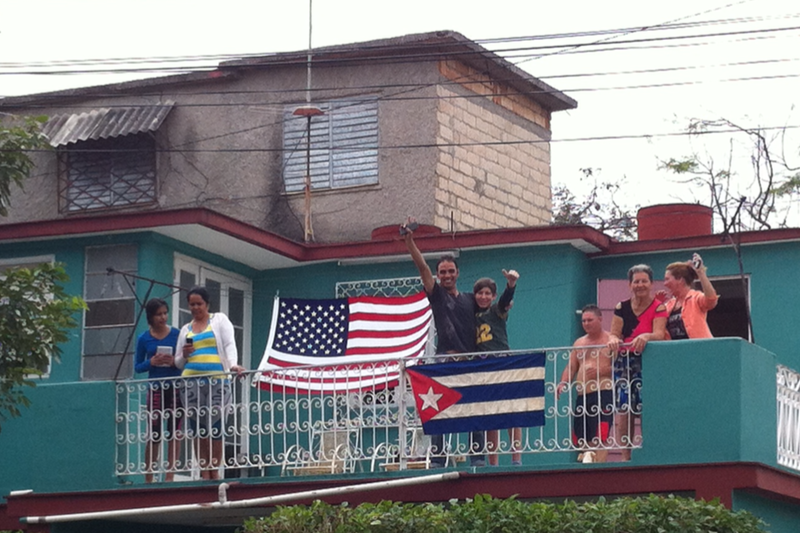 Perhaps most of all, I'll remember the Cubans who lined the streets, mile after mile, to greet us. They were men, women and children, smiling, waving, snapping pictures. Some were even waving American flags—another sight that not long ago would have been unimaginable. In the faces of these Cubans I saw hope for a brighter future. The Cuban people are ready for a new relationship between our two countries. The majority of Americans—including many Cuban Americans—support our new approach as well. It won't be easy. The long road ahead will see progress and setbacks. But the Cubans I met this week reaffirmed my hope that we can succeed, together. 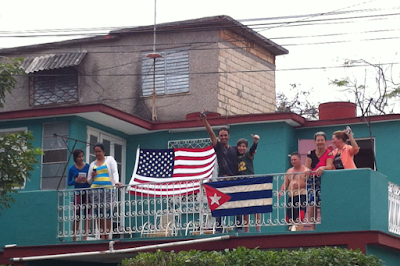 I believe in the Cuban people - creo en el pueblo Cubano. Wifi hotspot, corner of 23 & L, Havana, Cuba - With a rousing, historic speech in Havana's Alicia Alonso Grand Theater to a packed, expectant, and very appreciative crowd President Barack Obama launched a new era in US-Cuban relations today. Peppered with multiple words and phrases spoken in a fluent Cuban Spanish and filled with frequent allusions to the two countries' shared history of conflict and collaboration, Obama's speech was met with frequent, and sustained applause from the Cuban audience especially following his many references to and quotes of the Cuban "apostle," poet and independence leader José Martí. Indeed, after noting his resolve to continue to fight international terrorism following the attacks in Brussels today, Obama began his speech with the Spanish words: "Cultivo una rosa blanca," a line from a favorite Martí poem about friendship. Obama noted that the fraternal spirit of Martí is a great model to employ in the ongoing reconciliation between Cuba and the US in that Martí offered his white rose of friendship and peace to his friends and enemies alike. While the speech was a model of diplomatic courtesy and respect given that Obama began by directly thanking Raul Castro and the Cuban government for the gracious welcome they had extended to him and his family, the US president did not shy away from clearly expressing his belief in what he called universal human rights and democratic ideals. Quoting Martí's words: "Freedom is the right of every man to be honest and think and speak without hypocrisy," Obama laid out his vision of a future where every Cuban would be equal under the law, children could count on quality education and health care, and access to food and housing. But he also emphasized the need to respect the right to speak without fear, to recognize the legitimacy of dissent and the ability to openly criticize the government, an end to arbitrary detentions, and the value of free and democratic elections. Obama openly recognized the many flaws in US society but argued that democracy was the civil and open debate that societies need to confront and find solutions to such problems. He referenced the popular mobilizations of the 1960s civil rights movement as an example for Cuba where people came together to organize, protest, and challenge the system non-violently creating a path forward for positive change. In what was perhaps his best line, Obama referenced the current, chaotic US presidential election. But instead of using it to highlight the flaws of American-style democracy, he pointed out that only in America could two Cuban-American children of immigrants, run against the record of a sitting African-American president, while a woman challenged a democratic socialist! The speech was also notable in that it was addressed directly to and celebrated the ingenuity and sacrifice of the people of Cuba, both those on the island and those in the extensive Cuban diaspora abroad. Obama made clear that "el futuro de Cuba está en las manos del pueblo cubano," and highlighted the accomplishments of a new generation of Cuban entrepreneurs, celebrating some by name. He also inclusively honored the sometimes violent pain of the Cuban exile community in the US but noted with pride that if you want to know what Cubans are capable of you need to look no further than the booming city of Miami. While Obama noted that some had encouraged him to make a "tear down this wall" declaration similar to what President Ronald Reagan had done in East Germany in the late 1980s, he instead declared that he would leave Cuba convinced and hopeful that the Cuban people - and especially its youth - had already begun "lift something up and build something new," including bridges to a shared and prosperous future. He also celebrated the state-to-state collaboration between the two nations that had produced successful outcomes in combating Ebola in West Africa, peace in Colombia, and a shared honor of the life of Nelson Mandela in South Africa, repeating a rousing line from his December 17, 2014 speech: "Todos somos Americanos"
He stated that his administration had worked quickly to remove obstacles to such progress and collaboration, calling once again on the U.S. Congress to repeal the outdated embargo. However, he also noted that even absent the external embargo, not much would change on the island if the Cuban government did not also begin to remove the many internal restrictions and controls to greater freedom and prosperity for its citizens. Finally, while he made clear that the U.S. does not seek to impose its economic or governmental system on Cuba and thus that Cuba need not fear the United States, he also spoke directly to President Raúl Castro telling him that given his "commitment to Cuba's sovereignty and self-determination," he need not "fear the different voices of the Cuban people - and their capacity to speak, and assemble, and vote for their leaders." "President Obama should make this an opportunity to voice strong support for human rights and genuine freedom, for the people of Cuba" said Carlos Ponce, director for Latin America programs. "He should make clear that in exchange for closer political and economic ties, the United States expects genuine reform – including the release of political prisoners, ending spurious 'preventive' detentions, genuinely free elections, and guarantees for freedom of association." Cuba is rated Not Free in Freedom in the World 2016, Not Free in Freedom of the Press 2015, and Not Free in Freedom on the Net 2015. Join us on Facebook and Twitter (freedomhousedc). Stay up to date with Freedom House's latest news and events by signing up for our newsletter. In just a few days, President Obama will head to Havana, Cuba, becoming the first sitting president to do so in nearly 90 years. It's an historic trip — one that gives the President and First Lady a chance to meet with the Cuban government and hear directly from the Cuban people. President Obama will be in Cuba from March 20 to March 22, a short window to meet with Cubans from different walks of life who have different perspectives on how we can move forward in rebuilding a productive relationship between the United States and Cuba — one that is good for both our countries, and that improves the lives of the Cuban people. "For some months now, we have witnessed an event which fills us with hope: the process of normalizing relations between two peoples following years of estrangement." Havana is a source of great pride to the Cuban people. The President will walk past a few places that illustrate the history, cultural significance, and beauty of this historic city, including Havana Cathedral, Plaza de Armas, Museo de la Ciudad, Plaza Vieja, and Plaza de San Francisco. The following day, the President will lay a wreath and sign a guestbook in a ceremony at the José Martí Memorial. José Martí, known as "the Apostle of Cuban Independence," was an influential poet, journalist, and political theorist who became a symbol for the Cuban people's bid for independence. The concepts of freedom, liberty, and self-determination feature prominently in his work. As Martí said: "Liberty is the right of every man to be honest, to think, and to speak without hypocrisy." Our Cuba policy is focused on helping the Cuban people improve their lives. Since charting a new Cuba policy, the United States has made regulatory changes to open up commercial ties between our countries at a time when a growing number of Cubans are self-employed. In Havana, the President will meet with Cuban entrepreneurs, or cuentapropistas, to hear their experiences. The event will include American entrepreneurs who will share their own experiences with their Cuban counterparts and look for opportunities to build long-term relationships. During the day, President Obama will hold a bilateral meeting with Cuban President Raul Castro at the Revolutionary Palace to discuss a full host of bilateral and regional issues. The two leaders will discuss the progress that has been made on normalizing relations, review areas where we can use the President's visit to accelerate those efforts, and have a candid exchange about areas where we differ. Later that evening, the President and First Lady will return for a State Dinner. Just as he will meet with the government, the President will meet with a group of Cuban civil society, including human rights activists. A critical focus of the President's Cuba policy is our continued support for universal values and human rights — including respect for the right to free speech and assembly. We continue to have strong disagreements with the Cuban government on these issues, and believe that engagement puts the United States in a better position to raise those differences directly with the government, while also hearing directly from civil society. When the President announced a new policy toward Cuba more than a year ago, he said, "America extends a hand of friendship". President Obama will again have the opportunity to speak directly to the Cuban people with remarks at the Alicia Alonso Grand Theater, formerly known as the Gran Teatro de la Habana. His remarks in Havana will underscore that continued spirit of friendship, and lay out his vision for the future relationship between our two countries, and the extraordinary potential of the Cuban people. President Coolidge delivered remarks at the same theatre the last time a sitting president was in Cuba in 1928. Baseball is a great example of the cultural ties between the United States and Cuba and a powerful reminder of the shared experience between people that transcends our difficult history. The Tampa Bay Rays are traveling to Cuba to represent Major League Baseball in an exhibition game against the Cuban National Team at Estadio Latinamericano, which first hosted Jackie Robinson's Brooklyn Dodgers in 1947. The President is looking forward to the ballgame. It's a lot to fit into two days in Havana, and charting a new course with Cuba does not begin and end with the President and First Lady's visit. We have confidence that interactions like this — and between all Americans and Cubans — will lead to a better future for both countries.